Friday evening, @adamlambert took to twitter to discuss bullying. The tweeting went on for a better part of an hour. You can see it on his twitter feed at https://twitter.com/adamlambert but here is my favorite. And FYI- ANYONE is welcome in this Glamily. ANYONE. Please be welcoming and kind. Quit cyber fighting. On a different topic… you probably got the email with a list of our old articles. Just one more glitch on the path to the new website. The next week or so might continue to be slow and rocky as we continue our transfer/upgrade. Don’t worry though, we’ll still be around when the dust settles. We hope you like the changes so far! Congratulatiglamions Lila & team! So excited for you on your progress on the site and the LOVE for all that is ADAM! I’m a nut bar for Adam like the rest of the Glamily! AND DAMN PROUD OF IT TOO! Keep up the great work & the commitment to keep us up to date and in the know! Congratulations Lila & team! So excited for you on your progress on the site and the LOVE for all that is ADAM! 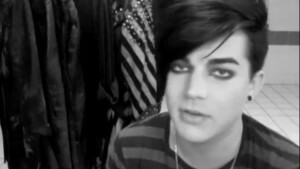 I’m a nut bar for Adam like the rest of the Glamily! AND DAMN PROUD OF IT TOO! Keep up the great work & the commitment to keep us up to date and in the know! LOVE the new look. GREAT job!